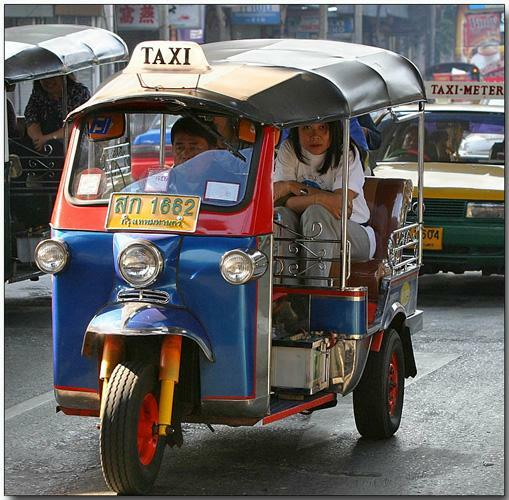 710 Study San Rafael Neighborhood Posts: Thailand's tuk tuk cars go "green"
Bangkok suffers from serious air pollution, prompting efforts to develop cleaner and more efficient ways to get around the city. An inventor there has developed a greener version of the city’s trademark mode of transport - the tuk tuk. The tuk tuk, a symbol of traditional life and tourist fun, is also a hot, smelly, noisy way to travel. With almost 4 million registered cars, along with 2.5 million motorcycles choking Bangkok streets, tuk tuks have contributed to the city’s major traffic conundrum. Already one of the world’s most polluted cities, Bangkok is facing serious air pollution problems. At a home workshop in Bangkok’s outer suburbs, Former Air Marshall turned inventor Morakot Charnsomruad and his team are geared up to take on the modern world. And it’s this revolutionary tuk tuk that is leading the way. "These tuk tuks are zero emission. That means, no pollution since there is no exhaust or smoke. It is quiet to drive and very easy to charge." said Morakot Charnsomruad, Chairman, Clean Fuel Energy Enterprise. Instead of the usual puff of oily black smoke and the growl that gives these three-wheeled vehicles its name, there is only silence. It can run the whole day on a battery boosted by a solar roof panel, supplemented by the sun’s rays. Faster than its gasoline-powered rival, its top speed is 60km/hour. The 3-wheeler definitely has a novelty value, but it could also help blaze a greener trail for Thailand. "It is a great idea. It is energy efficient and will help the environment. Tourists will love it. I support it." Said Sawai Arjsalee, Tuk Tuk Driver. They are a symbol of Thailand. 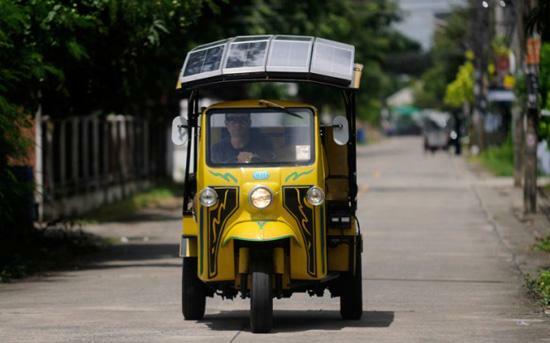 With currently over 70000 tuk tuks zipping through Thai roads, it is hoped that one day, this clear aid, solar powered tuk tuk will replace the noisy, polluted icons of Thailand. But that may take some time. At around $10000, they are almost double that of the conventional tuk tuks. The designer hopes that eventually government subsidies would make them more affordable. 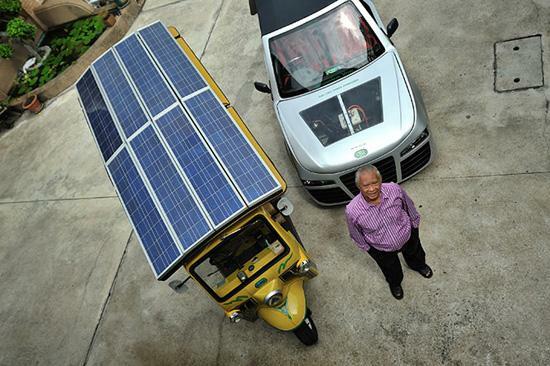 And as more emphasis is being placed on the importance of clean and efficient energy, these modified tuk tuks are hoping to pave the way to new transportation options.